NASA has been toiling away on a monster rocket for the past eight years — but how much action the skyscraper-size Space Launch System will see once it's completed is now anybody's guess. Designed to send humans and almost 60,000 pounds cargo to the moon and perhaps beyond, the SLS will be bigger and more powerful than any rocket since the Saturn V behemoth that took the Apollo astronauts to the moon 50 years ago. NASA has said the rocket will send Americans back to the lunar surface as early as 2024, with an uncrewed test flight tentatively scheduled for 2020. But the orange-and-white rocket has fallen three years behind schedule — and is way over budget. Almost $17 billion has been spent so far on the space vehicle, which was projected to cost $10.6 billion when its construction was approved in 2011. Experts say each SLS flight will cost at least $1 billion, or about 11 times more than SpaceX's Falcon Heavy rocket, which made its debut last year. Given the problems, has the time come to scrap the SLS and rely on commercial rockets to put astronauts back on the moon? Some key stakeholders seem to be wondering just that. 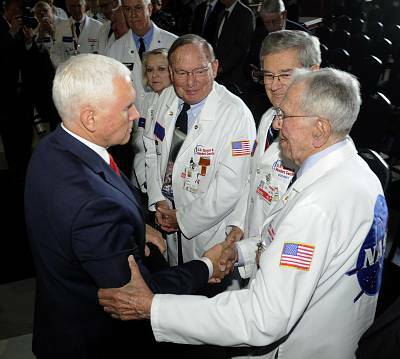 "We're not committed to any one contractor," Vice President Mike Pence said March 26 at a National Space Council meeting in Huntsville, Alabama. "If our current contractors can't meet this objective, then we'll find ones that will." Days later, NASA Administrator Jim Bridenstine called the SLS the "best option" for getting to the moonas soon as possible — but added, "There is nothing sacred here that is off the table." In any case, ditching the SLS may be difficult, given the political clout of the members of Congress representing districts in Alabama, Louisiana and Mississippi where the rocket components are being built and tested. The SLS program is managed by NASA's Marshall Space Flight Center in Huntsville, Alabama. The rocket's prime contractor, Boeing, operates out of NASA's Michoud Assembly Facility, 10 miles from New Orleans. SLS rocket engines are tested at Stennis Space Center, 40 minutes away in a Mississippi swamp. 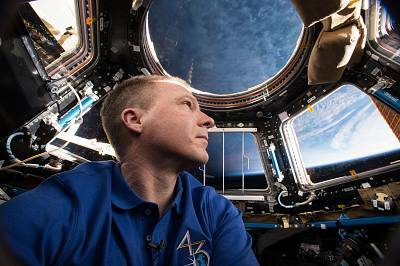 "You can blame George Washington and Benjamin Franklin and Thomas Jefferson," said Terry Virts, a former astronaut who flew on the space shuttle in 2010 and spent more than six months aboard the International Space Station in 2014 and 2015. "When they made the Constitution, they made these things called congressional districts. And the goal of Congress is to bring home the bacon for their districts." The SLS story starts in 2003, shortly after Space Shuttle Columbia broke apart during its return to Earth, killing seven astronauts. As NASA worked to return the remaining shuttles to flight and finish building the ISS, then-President George W. Bush pledged to send humans back to the moon by 2020. Bush's promise led to the Constellation program, which included an effort to build an Apollo-style crew capsule named Orion that would be launched on a rocket named Ares I. Additionally, NASA would build a giant cargo rocket called Ares V to send lunar landers, crew habitats and other hardware to the moon. "Constellation actually had a vision and a strategy to get there," Virts said. "It was the last time the government really had a plan in place." And it didn't last. President Barack Obama canceled Constellation in 2010after it fell behind schedule and went over budget. The move sparked outrage among some members of Congress, including then-Sen. Kay Bailey Hutchison, R-Texas, then-Sen. Bill Nelson, D-Fla., and Sen. Richard Shelby, R-Ala., then a member and now chair of the powerful Senate Appropriations Committee, which controls the federal budget. 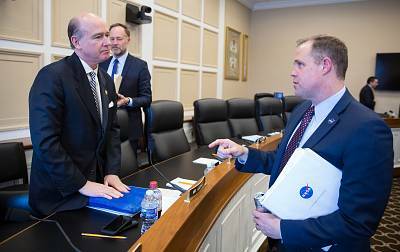 "Congress cannot and will not sit back and watch the reckless abandonment of sound principles, a proven track record, a steady path to success and the destruction of our human space flight program," Shelby said at the time. Facing what looked likely to become a prolonged political battle, the Obama administration struck a compromise: Ares I would stay canceled, but NASA could keep building Orion. 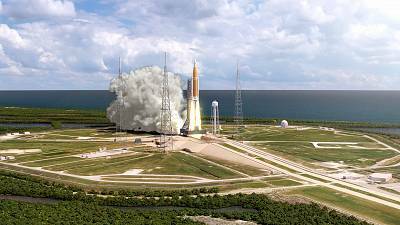 Ares V, re-christened the Space Launch System, would be used to launch both lunar cargo and the Orion capsule. Originally scheduled to fly in 2017, the SLS was kept grounded by a series of technical problems, including weak vehicle welds, a misaligned assembly tower and a tornado that hit Michoud facilities in 2017. Problems such as these are to be expected with a major initiative like the SLS. But in a 2018 report, NASA's Office of Inspector Generalblamed the agency and Boeing for sloppy expenditure tracking, questionable performance reviews that awarded Boeing millions of extra dollars and the granting of contract extensions without proper oversight. Laura Seward Forczyk, founder of the Atlanta-based space consulting firm Astralytical, blames these problems on so-called cost-plus contracts, in which NASA pays SLS contractors for all project expenses plus a fee that allows them to earn a profit even if there are cost overruns or delays. "NASA is going to continually get that money from Congress, and so there's no incentive for these companies to change direction, change management or change the way they're doing things," she said. NASA uses a different approach with the fees it pays SpaceX and Northrop Grumman to use their rockets for supply runs to the ISS: Cost overruns and delays are paid for not by NASA but by the companies themselves. Critics have said that NASA should buy, not build, its big rockets from companies like SpaceX using these "fixed price" contracts. 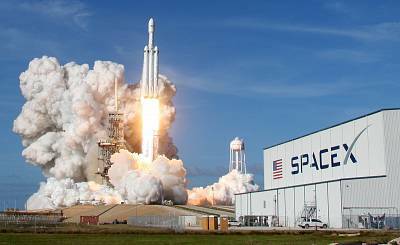 One possibility is SpaceX's beefy Falcon Heavy rocket, which the company's CEO, Elon Musk, announced in 2011 and which took its maiden flight in 2018. "I'll never forget being at Marshall with the leadership team the day that SpaceX announced the Heavy," said Lori Garver, NASA's deputy administrator from 2009 to 2013. She recalls NASA officials telling her: "Lori, you have got to tell your friend Elon he can't do that. He's in our lane. You made us get out of low-Earth orbit, so we've given him that lane, but this is our lane. We build the big rockets." 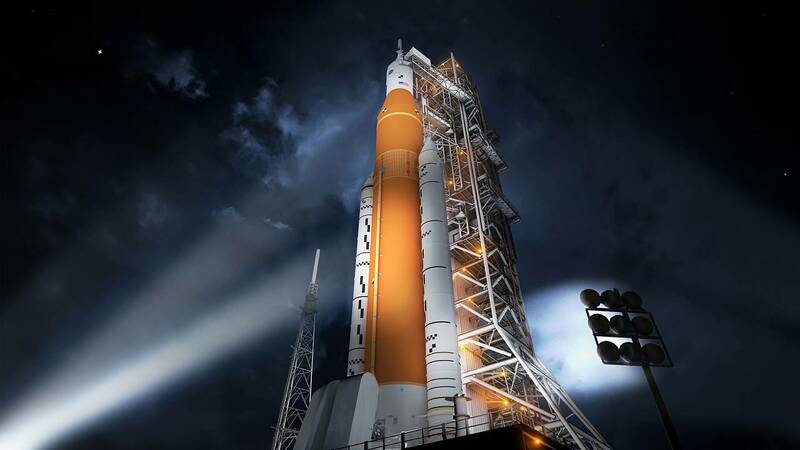 NASA has long said that only the SLS has the heft to launch the Orion crew capsule to the moon. But in an April 1 town hall meeting with agency employees, Bridenstine said the Falcon Heavy might work if it were equipped with a powerful upper stage from another American rocket: the Delta IV Heavy. Ironically, Boeing is a co-owner of United Launch Alliance, which produces the Delta IV Heavy. If NASA were to ditch Boeing's SLS in favor of SpaceX's Falcon Heavy, long-time aerospace rivals Boeing and SpaceX might have to team up. "Talk about strange bedfellows," Bridenstine quipped. NASA could soon have even more options for sending astronauts and cargo to the moon. Jeff Bezos' Kent, Washington-based Blue Origin is working on a rocket called New Glenn that comes close to Falcon Heavy's capabilities. And SpaceX is working on another rocket called Starship that would be more powerful than either Falcon Heavy or SLS. If the Trump administration winds up canceling the SLS, the agency may find it politically expedient to give Marshall, Michoud and Stennis something else to do to placate Shelby and other key legislators. "You're definitely going to need to see government dollars flowing to the right locations in order to have the cancellation of SLS be successful, in that it doesn't ruffle the wrong feathers within Congress," Forczyk said. At the National Space Council meeting, Pence hinted that the Marshall Space Flight Center could be tasked with advancing the state of in-space propulsion, a field that has seen less commercial investment. "As we continue to push farther into our solar system, we'll need innovative new propulsion systems to get us there, including nuclear power," he said. "And the president and I know there's no place on Earth better equipped to lead the world in pioneering these new propulsion technologies than Rocket City, U.S.A.," invoking Huntsville's self-proclaimed nickname. The Obama administration tried a similar strategy when it canceled Constellation, proposing that Marshall focus on next-generation engine development instead of building big rockets. But Garver said legislators rejected the proposal because they felt a large-scale project such as the SLS would be safer from cancellation in the long run. "We're like a cycling team, and the government should be running point and making it easier for our companies to be productive behind us," she said. "If one of them comes up alongside us and they're better at something than us, we don't take our air pump and jam it in their spokes — we take the next hill."